It’s starting to feel like summer here at the Free Library of Philadelphia. And with the start to the best season of the year, we’re excited for three months of activities, games, dancing, crafting, and, of course, reading! Summer of Wonder begins at neighborhood Free Library locations on June 12th and goes through August 4th. Children and teens get passport-style cards just for signing up in person. These passports feature themed Discovery Paths—Explore Your World!, Healthy You!, Just Read It!, and Sleuth the Truth!—which each have eight age-friendly activities to complete at home or in the library. Prizes for participating include books, lanyards, Phillies tickets, and much, much more. Children entering grades K-8 can also take part in the Phillies’ Phanatic about Reading program, which lets librarians nominate outstanding readers for special Phillies tickets, including a meet and greet with the Phillie Phanatic himself on the Citizens Bank Park diamond. 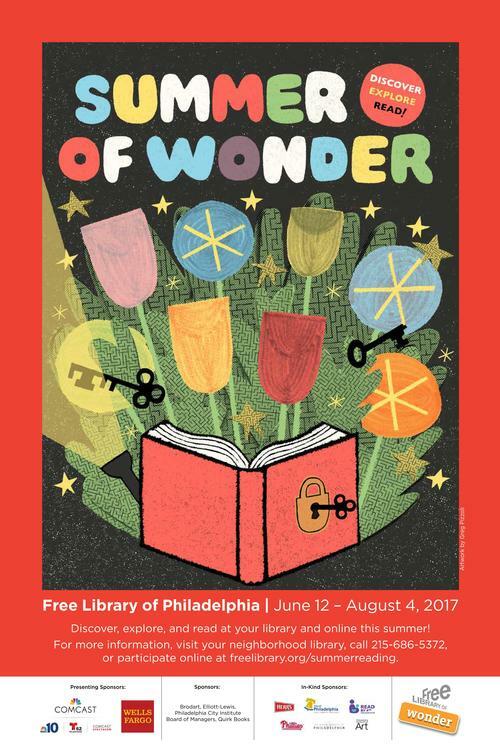 Check out the Free Library Summer of Wonder calendar to see what’s happening at your neighborhood library and to start winning! Wonder Kits, bags of themed activities and materials for children and teens, will also be available at every library with themes matching the Discovery Paths. The Sleuth the Truth! Kit includes detective gear, such as magnifying glasses and code wheels, so that families can join in on the Free Library’s We the Detectives fun. People of all ages can also participate online starting June 1st. Join by visiting our Summer Reading website, creating an account, and browsing to your heart’s desire. You’ll find book recommendations, activities for home and around Philadelphia, and even weekly raffle entries. There’s something for toddlers, teens, seniors, and everyone in between! Be on the lookout for photos and event announcements on Facebook, and follow us on Twitter, too, to stay up-to-date! We can’t wait for all the good times ahead, Philadelphia. Welcome to the Summer of Wonder, and happy reading! Add a Comment to Welcome to the Summer of Wonder!